Actor Vijay, who celebrated his 37th birthday yesterday, announced a slew of welfare activities, distributed scholarships and conducted blood donation camps. 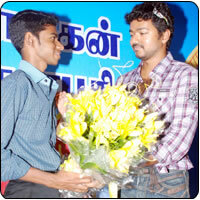 The celebrations went throughout the day, starting with the blood donation camp organized by Vijay fans. Vijay went on to distribute gold rings to new born babies at the Muthulakshmi Hospital in Thiruvanmiyur. The gold ring distribution ceremony extended to Municipal Hospital in Kodambakkam as well. After this, Vijay presided over the event that was held at Saligramam Shoba Kalyana Mandapam and announced that he would bear the higher education cost of about 37 plus two toppers. This was followed by an Annadhanam at Saligramam Kaveri School and at Chinmaya Nagar Elders Home. Vijay also distributed certificates in the evening at Shobha Mandapam for blood donors.